Installing PV solar panels for financial benefits? 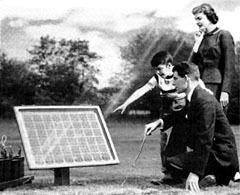 PV solar panels have been around for over 100 years. The rise of the feed-in tariff scheme in 2010 the solar panel market has been driven by a financial gold rush brought upon by the early scheme’s reward system. The market for this technology has gone from a small eco-industry to the new BMW clad sub-urban and middle-class market we see today. A big part of this drive came from the “free solar panels” and “rent a roof” companies which were set up specifically to take advantage of the early generous tariff rates. The tariff rates were supposed to degrade over time as take up increased, but this wasn’t done. A vital leg up for a fledgeling and important new industry suddenly became a free for all (excuse the pun) shambles. I personally feel the scheme, which was introduced by the last Labour government, was allowed to fail by the new Conservative-led government (but that’s another article). The green technology industry, not just the solar panels sector, has been stretched, shaken and damaged by party politics at a time when the rest of the world is actively clambering for supremacy in these much-needed industries. The resulting damage to our industry has caused some very long established solar companies, which have been trading since the 1990s to fail, such as Filsol and Solartwin more recently, with many less established companies falling by the wayside too. For this reason, I urge people who may be pondering the idea of installing solar panels to choose a company wisely. Always receive three quotes from a variety of solar installers while checking they are MCS and REAL scheme accredited for extra peace of mind. The green energy and solar industry have a very strong future ahead of it because people are only now wake up to the issues and urgency to long-term solutions of the rising cost of conventional energy supplies. The die-hard environmentalist I used to sell too in the early years (I salute you. You know who you are) were correct all along, it’s just a shame people only finally decided to install for financial gain, rather than the need to protect our only planet. To PV or not PV, that is the solar panel question? With the attention solely been focused on PV (photovoltaic) panels since the feed-in tariffs began, you could be forgiven for thinking, they are the only technology available, but electricity generating panels are not the only option. Solar heating panels were the most popular technology prior to the start of the feed-in tariffs. This now overlooked technology comprise of evacuated solar tubes or flat-plate panels, which can be equally effective at reducing your demand on expensive energy costs. For example, if your household and large family have a high demand for hot water, then supplementing your existing boiler can reduce your fuel usage and extend the life of your boiler too. As 90% of the companies currently selling and promoting solar panels focus only on PV panels, it would be advantageous for any family thinking of installing such technology, to also get quotes for solar heating too. Many people also install both electricity and heat generating panels at the same time, ensuring that they get the maximum benefit from the free energy hitting their rooftops daily. You may be able to get your installer company to fit both systems at the same time, thus encouraging a bigger discount if you do. You may not know that solar heating panels convert 60-70% of the sun’s rays to usable energy compared to photovoltaic technology with 15%, so it is always a good idea, to see which technology benefits your family the most.